“Medical tests” sounds so tame. They are tests of your soul and strength and humanity, too. All holes probed. Veins, brains, inbetweens. Late last week, we launched a dream of mine in the Sherpaa app. I’m so proud of our team and the concept. There are about 1.4 billion doctor visits in America every year. These happen in doctor offices in 10 minute or less increments and research suggests that patients forget 85% of what their doctor says during the visit. There are plenty of reasons for this. Most people don’t take notes. They’re stressed or sick. Their doctor is using jargon. You know the deal. That means, every year in America, there are 11.9 billion wasted minutes spent forgetting what doctors say. I think this is so stupidly inefficient and ineffective. When you leave your doctor’s office, you need to know everything that was said and have a crystal clear understanding of your situation and exactly what you need to do next. It’s very exciting and honestly a dream come true for me. Crystal clear communication with your doctor. Instead of only understanding 15% of your conversation with your doctor, you’ll understand 100%. That’s not an incremental, nice-to-have. That’s a revolution. I’m sorry about the image resolution. Seems like a tumblr limitation so click through to see it in all its full non-blurry glory. In retrospect Foursquare’s lack of celebratory badges for visiting hospitals, funeral homes, and psychiatric facilities was a smart move. 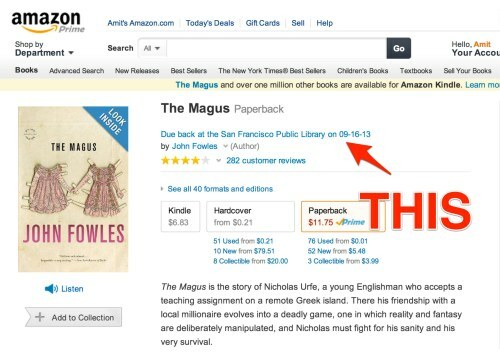 It takes you directly from an Amazon’s book page to its listing on your library’s website. From there it’s just a few clicks to place a hold or request! Amazon’s 100x better for browsing books than your library’s site, so this gives you the best of both. The LibraryLookup bookmarklet works with most libraries but you’ll need the Chrome plugin* for San Francisco. p.s. Thanks to nickbaum for the book recommendation! * You may have to do some convincing to get Chrome to install it.